A Web Portal is most often one specially designed Website that brings information together from diverse sources in a uniform way. 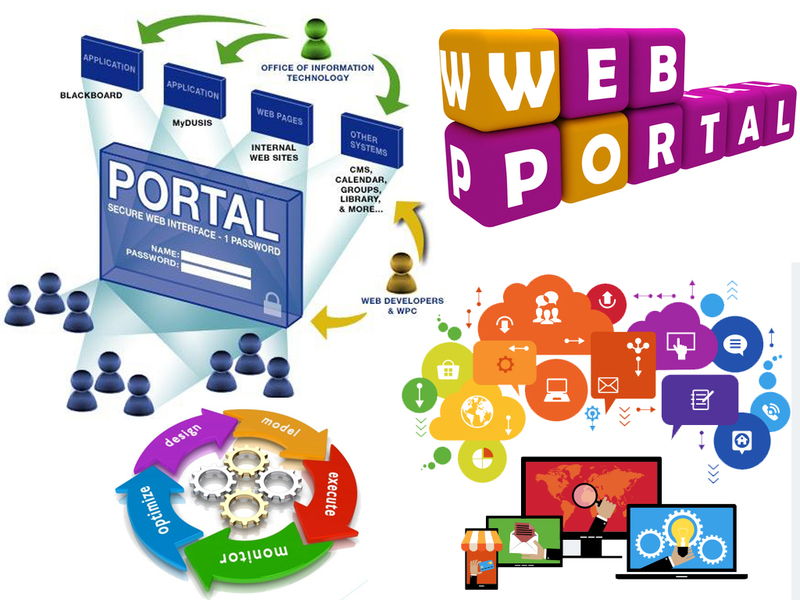 Initially, the term Portal was used to refer to well-known Internet Search and Navigation Sites that provided a Starting Point for Web Consumers to explore and access information on the World Wide Web. The original Portals were Search Engines. The initial value proposition was to offer a full text index of document content and a chance to take advantage of the hyperlinking capabilities built into the Web Protocols. Internet Navigation Sites, such as Yahoo, AOL, MSN, Netscape, Lycos, represented the next phase of Portal Development. The term "Internet Portal" (or "Web Portal") began to be used to describe these Mega-Sites because many users used them as a "starting point" for their Web Surfing. While these Public Internet Portals continue to flourish, the market for Portal Technology is increasingly focused on the better delivery of Corporate Information. Portal Technology has significantly matured since the Public Search Sites were first built, and has been used to build a diverse range of Portal Types, including Specialized Portals, Enterprise Portals, Workspace Portals, Market space Portals, and Knowledge Portals etc. Traditionally, a Portal denotes A Gate, A Door, or Entrance. Portalsare often the First Page the Web Browser Loads when users get connected to the Web or that user tend to visit as an Anchor Site. 1. What a Portal does ? Handles bothStructured and Unstructured Data. Automated Tuning: Pervasive Content can be tuned based on Personalization, Location, Browser, etc. 2. What a Portal is not ? It is not just a Website. (which is usually characterized by Static Information). It is not just a Personalized Intranet. It is not just a Personalized Extranet. It is not just a Personalized Front End for Business Applications. It is not just Groupware. It is not just a Personalized Knowledge Management Solution. It is not just a sophisticated Search Engine. Instead, A Portalis nothing less than just one Personalized Browser Based User Interface to all the components mentioned above. 3. What are the Major Functions of Portals ? Integration of Applications and Business Intelligence. 4. What are the Major Portal Types ? 5. Are you looking for better ways to connect and collaborate with your customers ? Here are some of the Key Benefits you can derive from building a Web Portal. Your Web Portalserves as a platform for customers to engage with your business on Web and Mobile Devices. Synchronize various Critical Business Processes and Operations through Automation and Integration with Third Party Systems. Our modular approach to building your Web Portalensures easy future enhancements and seamless Third Party Integrations with your Existing Portal. Login and other Key Pages that transmit customer information are secured using SSL to ensure that your customers can securely provide Personal and Financial Information on your Site with total confidence. With Multiple User Access being a norm in businesses today, we useTools and Frameworks with built in capabilities to accommodate role or permission based access with well-defined permissions for each user type. Periodic Update of Web Content is a basic and fundamental necessity for Businesses with Online Presence. To provide Seamless Content Management, we build Portals with well-established CMS such as Refinery, Drupal, Joomla and WordPress. Most of the time, we customize an Off-The-Shelf Product such as Drupal, thus providing our clients access to numerous modules (such as Calendars, Chat, E-Commerce, and Discussion Forums) developed by the Open Source Community, that can be readily integrated to their Portal. Improve Customer Interactions with Portals designed to meet your Unique Business needs. Extensive Experience Developing Robust Web Portals, catering to the diverse needs of our customers. Customer Centric Approaches where we listen to our customers, understand their goals, and suggest best fit solutions. Expertise in developing Web Portals on Multiple Platforms including WordPress, Joomla, Drupal, and Refinery.